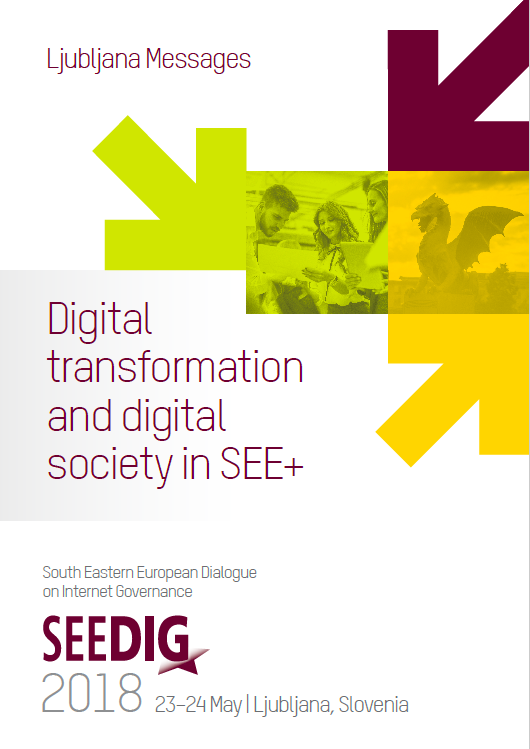 Under the overarching theme ‘Digital transformation and digital society in SEE+’ and having ‘data’ as a cross-cutting topic, the SEEDIG 2018 annual meeting (Ljubljana, May 2018) featured discussions and exchanges of experiences on a broad range of issues, from digital literacy to network and platform neutrality, and from digital rights to cybersecurity. These discussions are reflected in key messages, outlining main takeaways, possible goals, and proposals for future actions. The messages, endorsed by meeting participants, represent the main output of the meeting. Through wide distribution, at regional, European and international level, they are meant to help inform and influence decision-making processes within governmental entities, national parliaments, companies, and regional organisations. We invite you to read these Messages and help us share them within and beyond the region. For more details, consult the Messages from SEEDIG 2018 brochure. The SEE+ region needs a common digital agenda, and enhanced cooperation across the region is an essential step in this direction. To more efficiently and effectively address the challenges that come with digitalisation, we need to build on the region’s strengths (such as its human talent and cultural diversity) and create a framework for cooperation and exchange of good practices among countries and among all stakeholder groups. The essential precondition for bridging digital divides and for the digitalisation of the region is infrastructure. Countries need to deploy high speed broadband networks, also in rural areas, and prepare for the deployment of new generations of broadband technologies. Proper regulation and enhanced market competition are needed for the creation of an enabling environment. Sustainable digital development across the SEE+ region can only be achieved by creating a stimulating environment, through a holistic approach and the involvement of all stakeholders in a bottom-up multistakeholder model. We need to actively support this model through building and empowering communities that cooperate towards achieving common goals. To join the next wave of data-driven development, we need to have more ambitious goals, at national and at regional levels. More focus should be placed on developing digital skills, supporting the digital economy, and enhancing cybersecurity while ensuring the protection of digital rights. Countries must acknowledge that brain drain is a serious issue in the region and act to address it. Structural changes across the educational and economic sectors are needed to overcome this phenomenon. An enabling environment needs to be created that allows young people to thrive both educationally and entrepreneurially, or we risk lagging behind. To fully benefit the opportunities of digitalisation, we have to engage in a lifelong learning process to develop our digital skills and keep pace with the constantly evolving digital environment. All stakeholders should play an active role in advancing digital literacy. Governments should adopt policies with input from all relevant stakeholders. Digital literacy should be part of the school curriculum from early ages. Teachers and students should have resources in native languages. Countries in the region should cooperate in advancing digital literacy by sharing experiences and good practices, while building on country-specific contexts. Authorities have a responsibility to keep the Internet open for everyone. Transparency is key for ensuring network and platform neutrality. Neutrality of platforms is important for democracy and it should be protected as a way to enhance competition not only in applications and services but also in innovations, business models and ideas. All stakeholders should be involved in finding safeguards to protect net and platform neutrality. Balanced and principle-based regulation should better serve the interests of both businesses and users. Over and under-regulation should be avoided so it does not harm investments, innovation and customer needs. A future-proof model of net neutrality is difficult to determine now and specialised services should not endanger Internet access. Regulators should be able to efficiently and effectively monitor, and, eventually, regulate online platforms in order to protect consumers’ rights. End-users should be informed and able to understand the effects of new business models based on practices such as discrimination, prioritisation and zero-rating. The Internet has helped people discover who they really are, even gender- and sexually -wise, so it should stay open as a space for discovery and discussion. Internet companies need to play a more active role in fighting gender-based online violence that occurs on their platforms. All stakeholders should strengthen cooperation with one another and share best practices in order to ensure child safety online. Especially youth, parents and educators must be made aware of possible risks online for children. Keys to safeguard freedom of expression and tackle disinformation are awareness and education: media literacy and critical thinking must be top priorities from early ages. The possibility of cooperation between national Computer Emergency Response Teams (CERTs) of non-EU SEE countries and European Union Agency for Network and Information Security (ENISA) should be further explored. SEE countries should cooperate in cybersecurity amongst themselves, emphasising practical messages for an SEE digital agenda. A cybersecurity culture should be built in the region. To achieve it, SEE countries must raise awareness, educate citizens and cooperate regionally, which requires the partnership of all stakeholders. Regional and intergovernmental organisations do make an effort to put cybersecurity on the agenda in SEE. However, it should be complemented with coordination of internal, national, and regional efforts by other actors such as ministries, regulatory bodies, technical community and so on. SEEDIG as a multistakeholder platform can provide a unique space for such discussions and cooperation. Data protection is vital for a data-driven economy. Strong regulation such as the EU General Data Protection Regulation (GDPR) is the first step towards enhancing the trust of users, ensuring privacy and transparency, but it should be followed by equally strong enforcement. Governments and civil society should do more to raise awareness and build capacities among end-users about the ownership of data and how their personal data is being collected, processed and shared. Collaboration is key and SEEDIG should be used as a platform to map the challenges in implementing GDPR in the region, particularly in the non-EU member states. Questions of consent and notification about data breaches are important. There is a need for a clear set of rules on when and how data subjects should be informed about data breaches, as well as for continuous revision of data protection rules and regulations. Developments in the field of the Internet of Things (IoT) come with challenges such as privacy, security, and the risk of widening the digital divide. But stopping technological progress is not a solution to these challenges. Instead, regulators should act promptly and devise policies and regulations that support IoT progress while addressing the challenges. In the data-driven economy, blockchain can serve as a reliable mechanism for providing more privacy, user-centred solutions, transparency, and credibility of data. This can enhance trust in data processing mechanisms. There are also concerns about the immutable nature of the data in blockchain. All actors should work on containing/mitigating the potential misuse of this technology to profile user behaviour online. Personal data needs to remain in the property of users. A key issue to be considered is that developers influence decisions made by artificial intelligence (AI) systems through the principles and choices they instil in the programs and algorithms they build. This is why ethical principles should be at the core of AI development. AI brings many benefits, along with complex challenges. We should take advantage of AI to make our work easier, but we should also be aware of things that AI cannot achieve such as values, ethics, empathy, emotions. AI should be regulated since the technology is readily being used in various fields and businesses. The impact of IGF initiatives is not easy to measure, but there are concrete examples of how the discussions held at IGF meetings had a positive impact on organisations and countries. In one illustration, the discussions at the Bosnia and Herzegovina IGF on Internet Exchange Points (IXP) led to the creation of an IXP in the country. Resources (human and financial) are essential for building sustainability into IGF initiatives. SEEDIG is a valuable initiative in the SEE region, and its most valuable asset is its community. But there is much more potential to be explored. We should build on what we have and continue to evolve, through consolidating the community and engaging with new stakeholders, enhancing the capacity development activities, and strengthening the intersessional activities. In the multistakeholder model of Internet governance, everyone is a stakeholder. The question is: How big are the stakes? Answer: If you do not participate, you will never know. The ‘IGF family’ is in its teenage years: after 13 years, the teenager needs to find itself and its way. Parents, whoever you are, you need to love, educate, and support your kids. Money is the key to the sustainability of IGF initiatives, like for anything in real life. We need to address the lack of money to cover all wishes of a teenager. What is the impact of IGF initiatives? And where do we want to go? Don’t ask a teenager about that yet. Wait for him to grow, even if he is a musician.